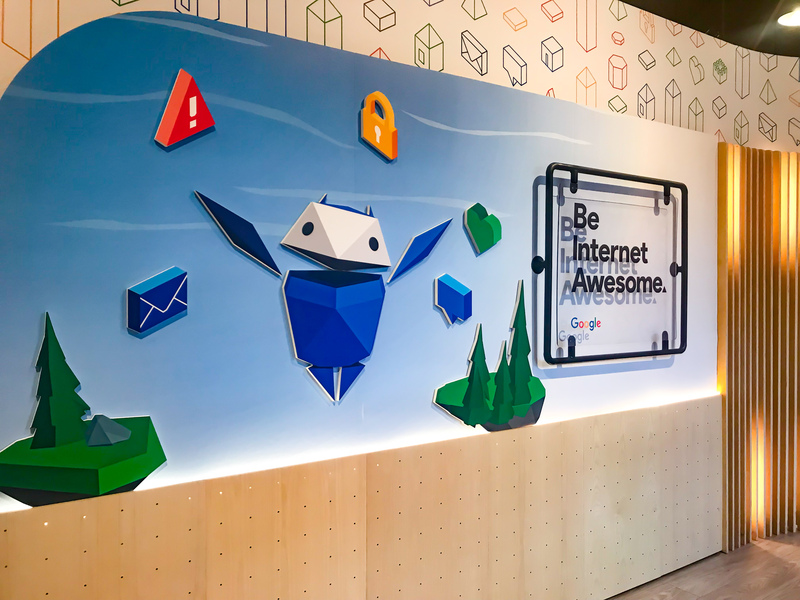 I recently spent an afternoon in San Antonio, Texas to visit the Google for Education pop-up installation made in honor of Safer Internet Day. The pop-up is geared towards kids who use the internet and/or mobile devices, as well as their parents and teachers. To give a bit of a background story on this pop-up, Google for Education is working to create a better internet for families, by creating a Family Guide on navigating the internet as well as an interactive educational game that’s available for anyone to use for free online, called Interland. Interland allows kids to test their skills on their internet safety knowledge. The easy access online game works to teach the fundamental five pillars of safe internet practices: Smart, Alert, Brave, Kind, and Strong. At the panel we attended prior to the pop-up’s opening, we learned more about how these five pillars are at the core of internet safety practices, and how it is crucial to begin teaching these pillars at a young age in schools, as well as at home with our own kids. Being internet “Smart” means thinking about what you say online before you post it. Consider if private information is being protected before you post. Be internet “Alert” – This pillar encompasses a few crucial internet practices, such as making sure sites that you give information to and enter passwords on are legitimate, credible URLs. It also means be on the lookout for identifying spam email messages, and being careful about what you download on your computer. Being internet “Strong” includes creating strong passwords for logins, switching up passwords that you use, and using creative passwords that do not contain personal information. Be internet “Brave” means not being afraid to ask for help or advice when it comes to the internet. If our kids aren’t sure if something is appropriate, or credible, encourage them to talk it out with a trusted adult to help them make the safe decision. It also means teaching our kids that if they see cyberbullying, or if they themselves are being cyber bullied or receiving inappropriate messages to report it to a parent or teacher. Talking things out can be tough, so having this open dialogue about talking about the negative things we experience on the internet in addition to the positive is crucial for children’s safety while navigating the internet. Lastly, a pillar that I find quite important to create a more positive internet, is Be Internet “Kind.” This includes being nice to others on the internet. Think before you type, making sure you would only say things online that you would want to say in real life. Being an advocate for a positive internet experience, and be kind online. This also means standing up for others if you see harassment, not by interfering online but by reporting the situation to a parent, teacher or school counselor. I think children and adults alike can agree that we can all use a more positive internet. Myself, and most people I know who have are publicly on social media have received some form of trolling online. However, the people though who use their social media platforms to spread love and kindness make a world of difference in my book! Although my daughter is four and hasn’t had to experience the wild world of the internet yet, I know as a child growing up around mobile devices and an internet-reliant world she will likely begin using the internet when she starts elementary school. I think having this knowledge of internet safety for our children early on is fantastic, so I can begin to teach her these five pillars as she first learns to use the internet for school. As someone who wonders what the future will be like for kids born during this internet and social media-reliant time, it puts my mind at ease to know that there are non-profits, as well as technology companies like Google already putting out amazing resources to help our kids (and parents) to navigate this new way of growing up. You can access the free Interland online program that teaches kids these five pillars by visiting here. You can also find Google for Education’s free Family Resource Guide on their site here.